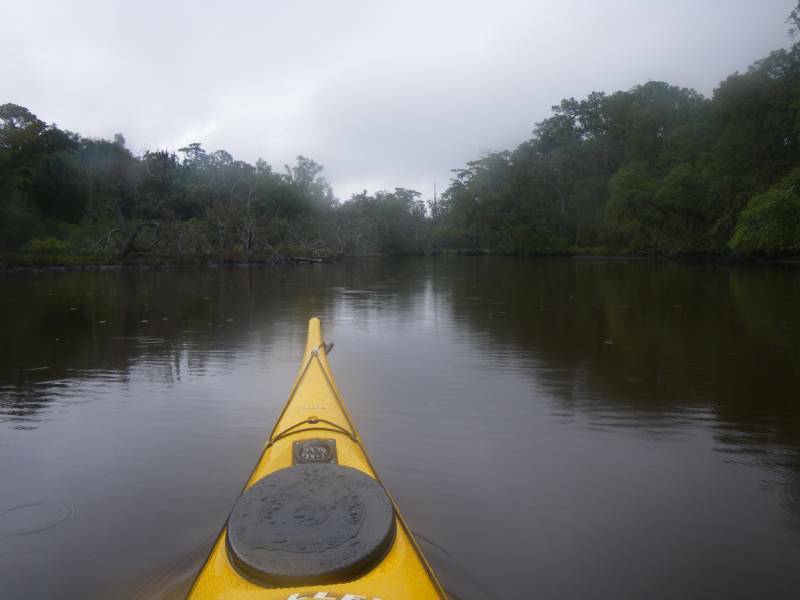 For this story I’ll tell the ending first as it involved some of the most challenging and exciting paddling conditions that I’ve been in a while. 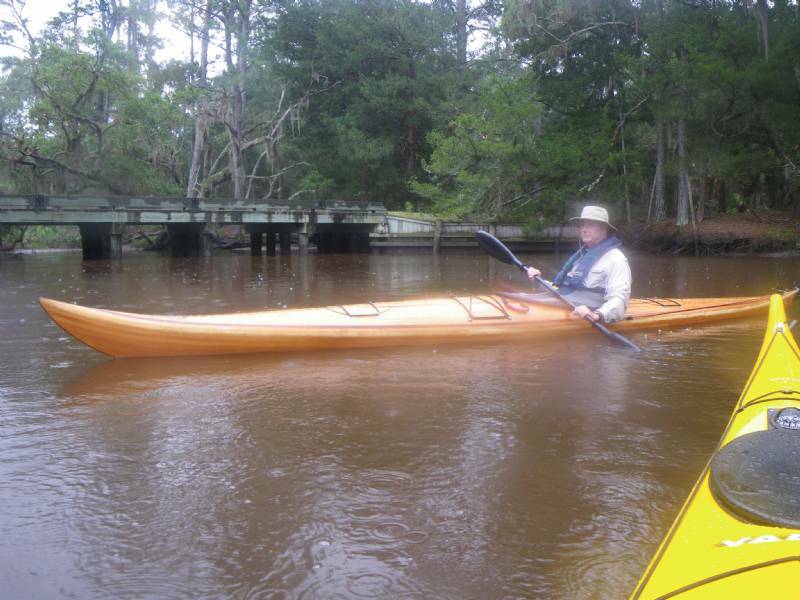 So, after paddling for almost 6 hours and 28 miles, Bob and I had saved the hardest part for last: crossing back over the St. Marys Inlet – from Cumberland Island to Fernandina. As we rounded the southern most part of Cumberland, the SE winds of 15-20 mph became headwinds. We knew the current was swiftly flowing out the inlet so we agreed to a visual target, just west of a large stationary tower, hoping to quarter into the winds and waves and avoid being swept too far out to sea. The wind driven chop was probably 2-4 feet and manageable until we approached the main channel. Then we noticed the faster current and larger sea swells, 6-7 ft, moving in from the ocean, almost on our beam. We knew then it was going to be a wet and white knuckle ride! About half-way into the channel we ran into some of the largest sea swells, probably 12-15 feet high, which seemed almost as high was my kayak (18 ft) was long. My biggest worry at that time was that they might break onto us – that would have certainly complicated the crossing. Those big swells were very steep and thus close together at the trough (bottom), so we’d spring off the top of one then down into the trough between it and the next wave. Sometimes they came in pairs, sometimes three in a row. Bob and I pushed along, swinging further out to sea just to maintain a better angle for the wind waves and to be able to pivot around to take on the really big swells. The biggest set was the last, three waves moving fast that were at least 15 feet high. The outgoing tide was standing these waves up so they were actually higher in the channel than out in the open ocean. After approximately 30 minutes we had made the 1.1 mile crossing, coming up to the shore about 3 sets of jetties east of where our target was originally, and just above Fort Clinch. Looking back it was impossible to see how big those waves were from the seat of our kayaks, just as they were not visible from the other side prior to the crossing. So that’s how we finished up a nice long trip to Plum Orchard from the 14th street boat ramp. 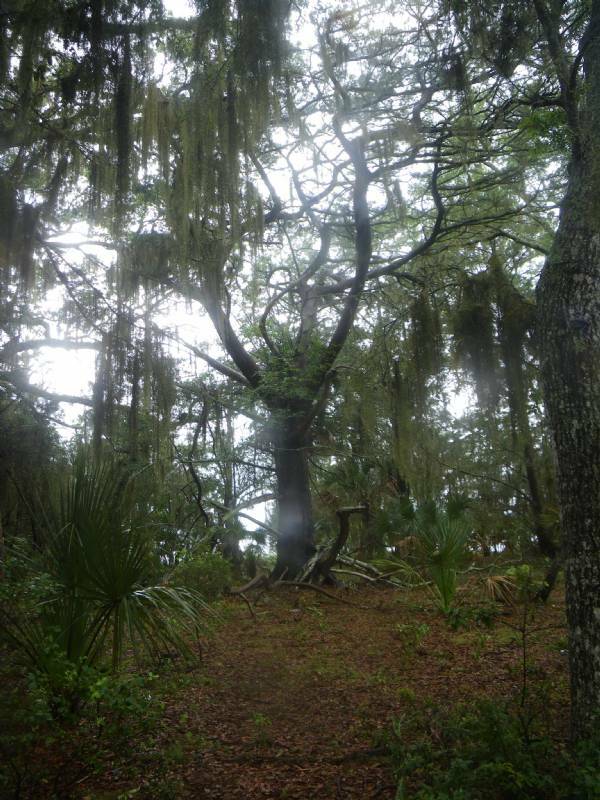 We had planned to meet Andy as he made the turn around Cumberland Island. He was doing his monthly circumnavigation of the island and we thought it’d be cool to meet him somewhere on the inside as he headed back to Fernandina as well. 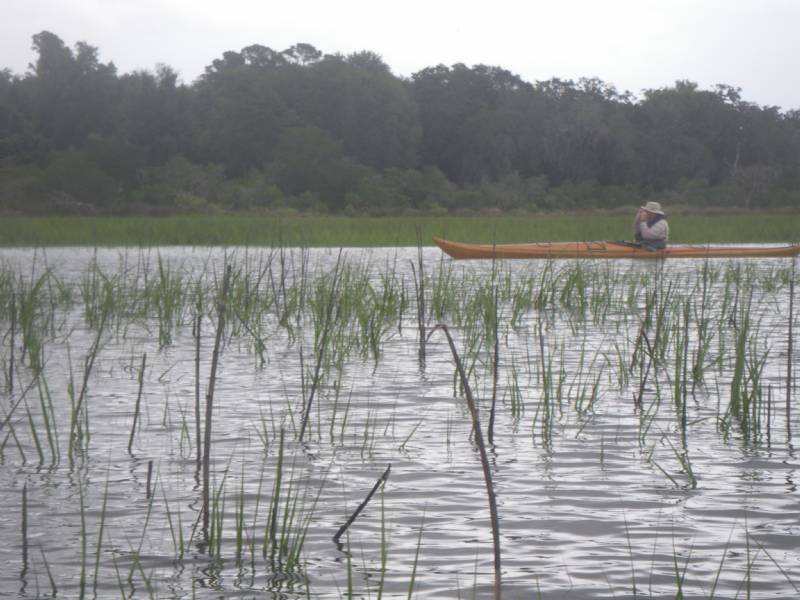 Bob and I launched at 9:30 and after a 20 minute bumpy ride were across the inlet, heading north on the inside of Cumberland Island. The incoming tide was to push us all the way to Plum Orchard, some 13-14 miles away. With comfortable temperatures and overcast skies we moved along quickly and effortlessly. Stopping at Sea Camp allowed us a chance to stretch our legs and take a look at the weather. 50% change of storms later was the forecast, with clouds already building to the west over land. Back on the water we passed several private docks above Sea Camp, the bright red metal roofs of their homes contrasting easily with the thick green forests of the island’s interior. We were paddling from memory, with only an old satellite map to help guide us along, and our next objective was to find the Greyfield Inn, then the Stafford Island cut. 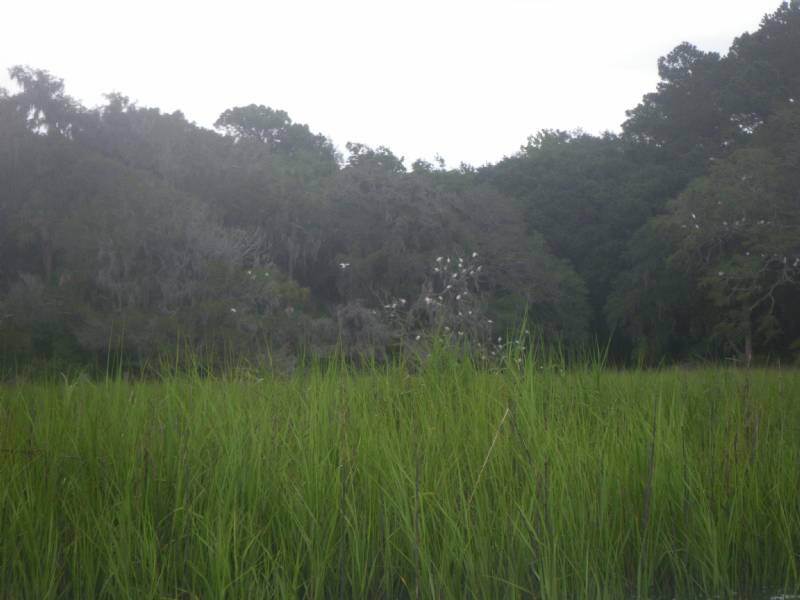 Several rain squalls were moving in from the ocean so Bob and I prepared to get wet and discussed what to do if the wind increased too much (pull into the marsh grass backwards, facing away from the piercing raindrops). 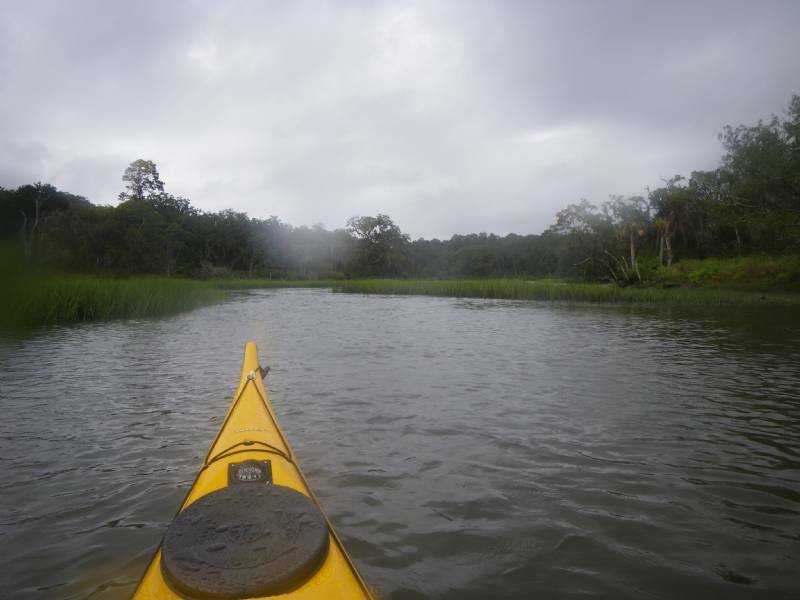 Paddling along quickly with the current, we moved along the marsh edge and pass a large contingent of white ibises nesting along the shore, protected by 100 yards of marsh grass. Sometime around 1 pm, we took a miss-turn (I was thinking it was the Stafford Island cut), when actually it turned out to be the most interesting place: Duck Creek and Duck Lake. We followed this winding creek for over a mile, which led us past the horses (see the Photo Gallery) and into the island’s interior, running eventually into a bridge along the Stafford / Beach roads. That bridge spanned one end of Duck Lake, which contained lots of dead (and some living) cedar trees. We looked around for alligators but saw none, although we did see one in the creek on the way in. The incoming tide had pushed us through the creek and into the lake, so now we had to reverse course and try to follow the main creek bed back out to the ICWW. Within 15 minutes we save the channel markers and then turned back east into a larger channel toward a boat dock with two very large sailboats. We didn’t realize it at the time, but we have actually made it to Plum Orchard. With the rains ending we pulled up to a cedar tree, turned on my VHF radio and pulled out lunch. It was 1:50 pm, past time for lunch! 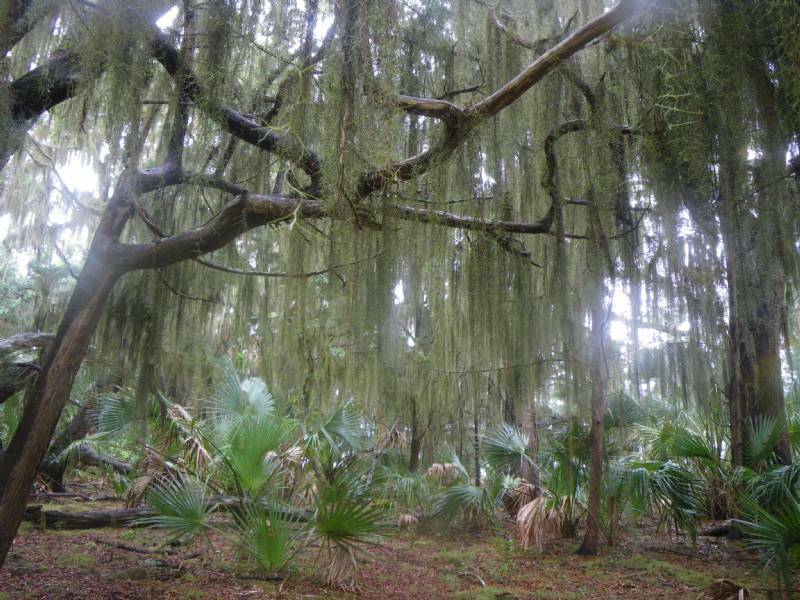 After lunch we got out of our boats and walked into the edge of the woods, marveling at the large cedars, brown forest floor and vivid green Spanish moss hanging from all the trees. I suspect the recent rains are the reason for the moss color, but will have to research that to be certain. We tried reaching Andy on the radio but only silence returned. With a fully charged battery I decided to leave it on and strapped it onto the front deck. My VHF is pretty cool: it floats, has a strobe light, GPS, emergency call for help button along with the Digital Select Calling feature. DSC allows me to register the phone with my ID info and I have my own unique ID number, a number that any other DSC radio can call directly. Pretty cool stuff, especially the emergency call feature. All of those radio features are nice but unfortunately we never did make contact with Andy. It seems he was headed south down the ICWW and was near Crooked River around 1:30, while Bob and I were zigg-zagging through Duck Creek. We probably would have run into each other if not for the Duck Creek side-tour, but the creek was a very nice find and we’ll return again someday (at high-tide only). 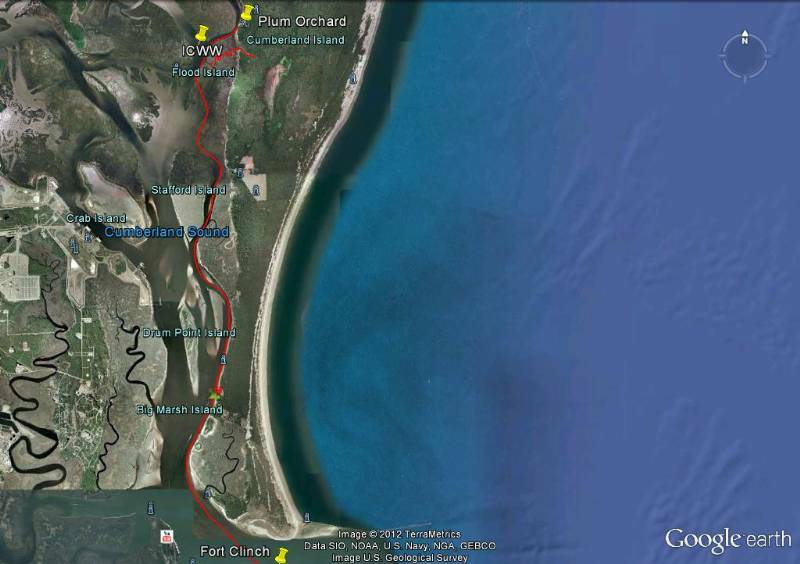 Bob and I finished lunch and then paddled up to the sailboats and Plum Orchard dock, still trying to contact Andy. Heading toward us from the south was a very strange looking vessel, like nothing I’ve seen before. As it got closer we realized it was a floating automobile ferry, loaded with two vehicles and 5-6 people, 1 dog and being pushed by a power boat. Its loading ramps were in the upright position, adding to its odd look. They came clean around the pier then aimed straight for the sloped dirt ramp, to which they ploughed onto then lowered their own ramps. The people on board were wearing rain gear and the vessel seemed to have about 1 foot of free-board. It was simply a wooden floating dock, maybe 40 feet long and 20 feet wide. The power boat was tied to it from behind with multiple ropes to allow it to turn and provide the needed propulsion. 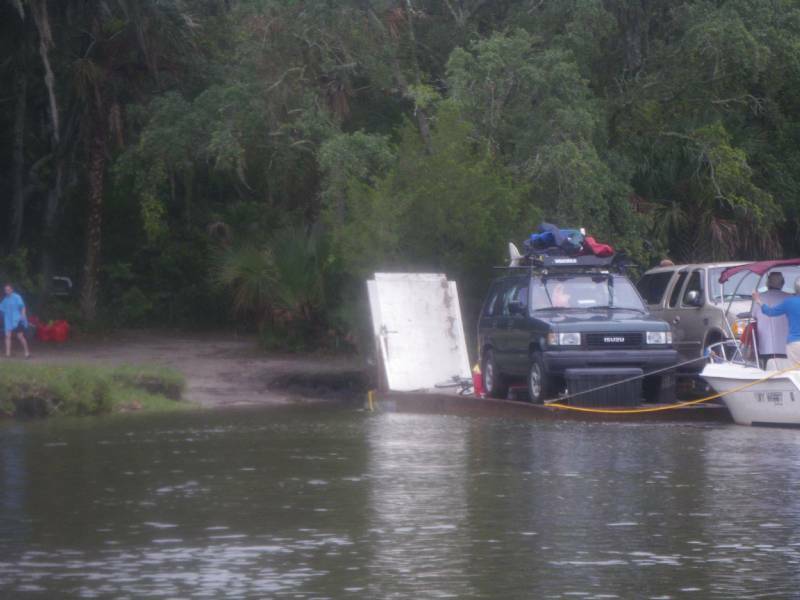 After unloading their people, gear and two SUVs, the captain tied the ‘barge’ to the dock. He told me they had traveled down from Crooked River and head first into those same rain squalls that hit us. Only they were “shipping water” over the front, according to the captain. He softly laughed at it now, but it sounded like it may have gotten a bit dicey along the way. 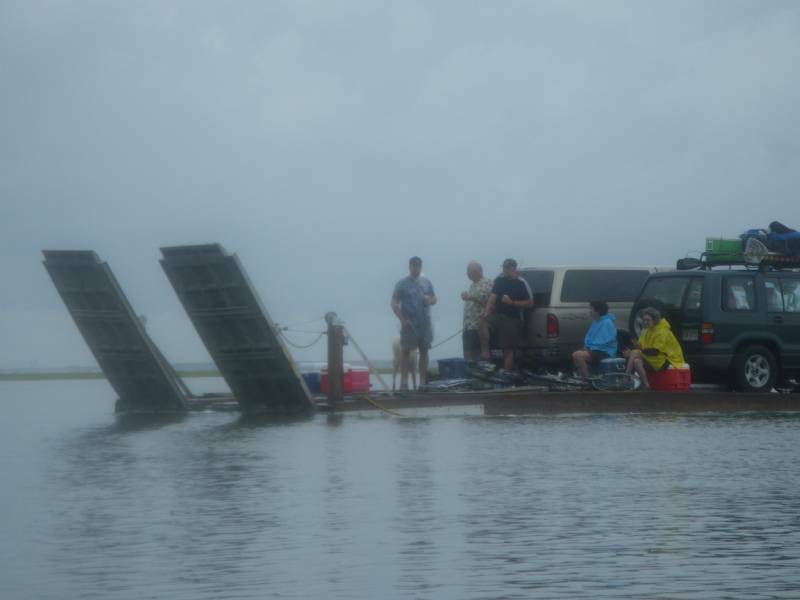 I suspect the passengers were all loaded into the boat on the trip down, and not inside the dry SUVs, just in case the barge tilted over and spilled its load. Bob and I walked up to the Plum Orchard mansion, hoping the elevation would allow Andy to hear us, but to no avail. We gingerly walked through young prickly pear cactus in the ‘front yard’ of the mansion, then back to the water. With an additional rain squall appearing to the south we wanted to be on the water if the rain re-started. It was now 3:45 as we pulled away from the island and back along the ICWW, heading south and hoping Andy was doing okay (he does this route every month and was fine, we just didn’t know where he was). The trip back was a bit faster, with our route taking us straight past Flood Island, then Stafford Island before we saw the Sea Camp dock. We saw 4 sea turtles along the way, one manatee, one alligator and a very large manta / sting ray that Bob saw fly out of the water. Along with the usual dolphins, we saw lots of wading birds (mostly White Ibises and Ospreys, a few Great Blue Herons and White Egrets, and three Roseate Spoonbills). As for trip distance and times, our outgoing route distance was 16.7 miles, as traced by Google Earth and following the various turns and twists I led Bob through (including the miss-turns). 4.25 hours computes at 3.9 mph. Heading back to Fernandina, our route was only 12.75 miles in length, taking 2.45 hours = 4.6 mph. 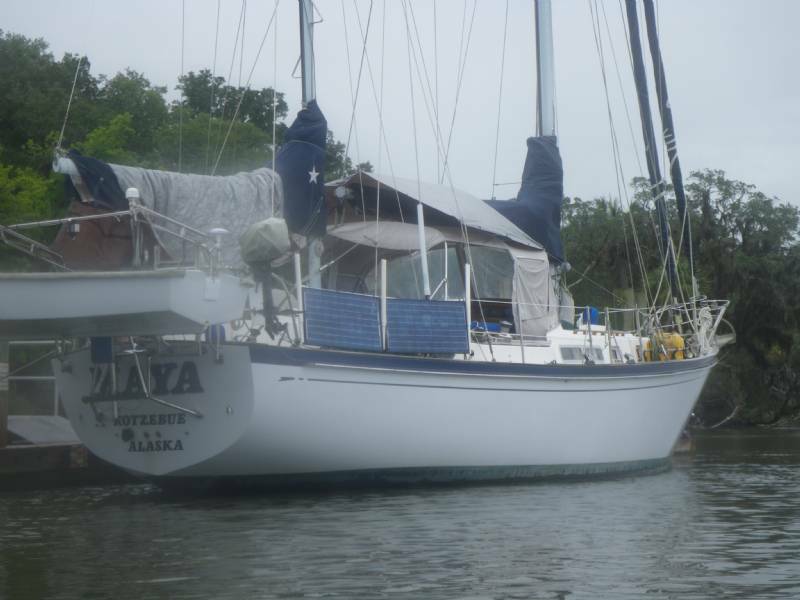 Total round-trip distance was 29.5 miles and time on the water was approximately 7 hours. 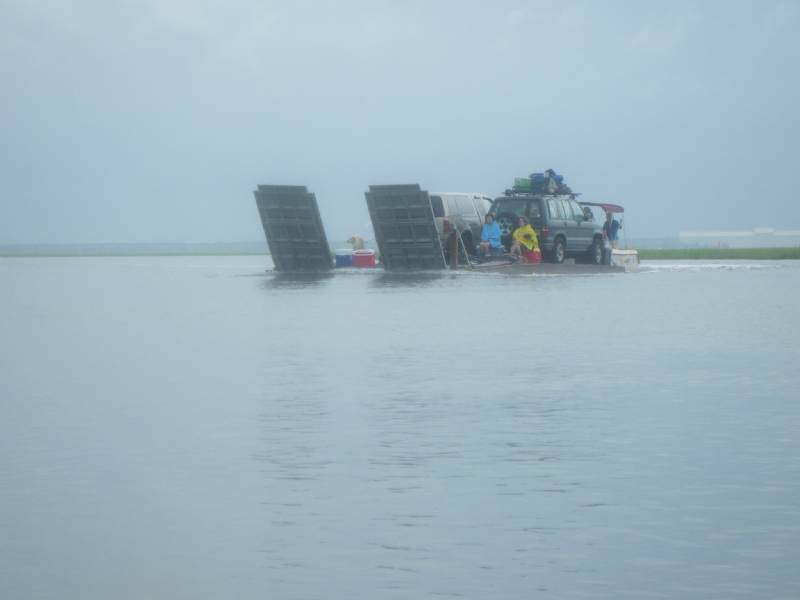 Overall, this trip was a bit different from most trips to Plum Orchard, primarily because we arrived at high tide. 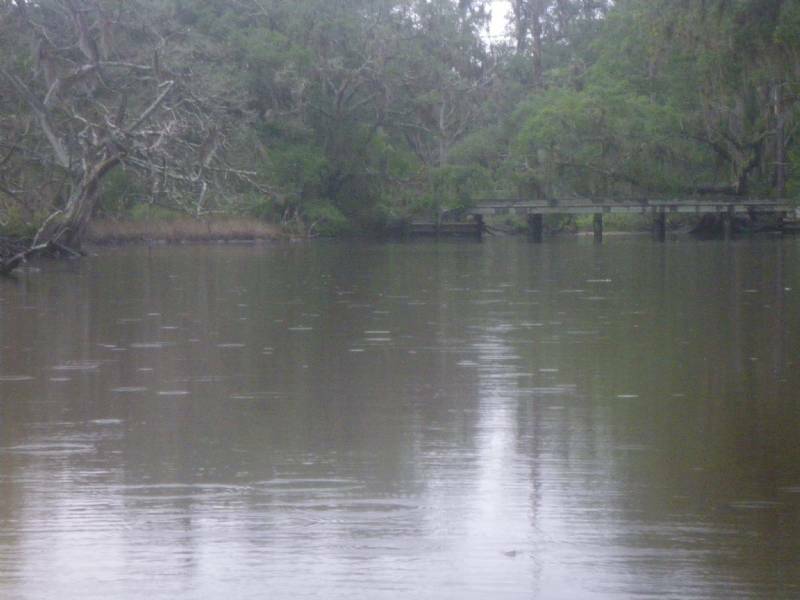 Usually it’s low, meaning 4-5 feet less water along the island shoreline and the creeks (like Duck Creek and Lake). 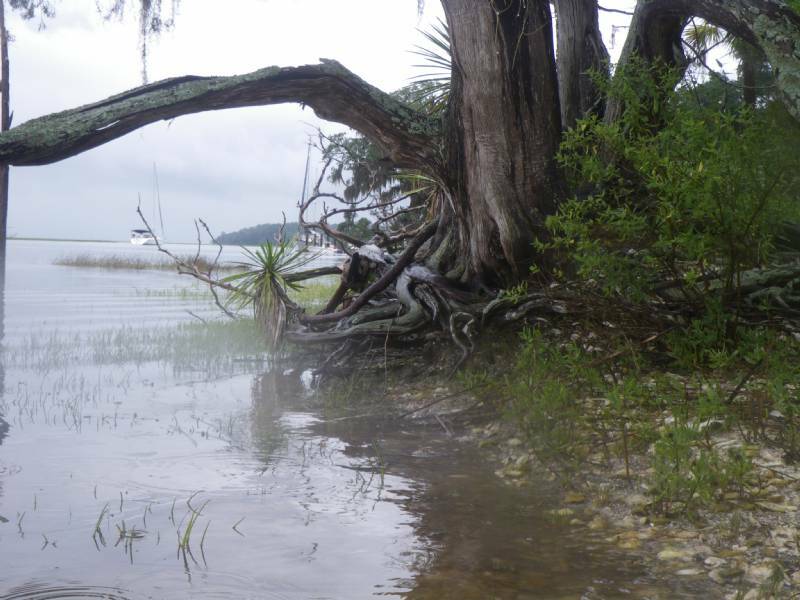 We probably couldn’t get into a lot of the marsh, the lake, nor the creek if not for the high tide waters. Those horses didn’t appear surprised by us either, as we drifted past at no more than 30 feet away. That was pretty cool. Notice: Reported conditions may change and there may be errors in this text. 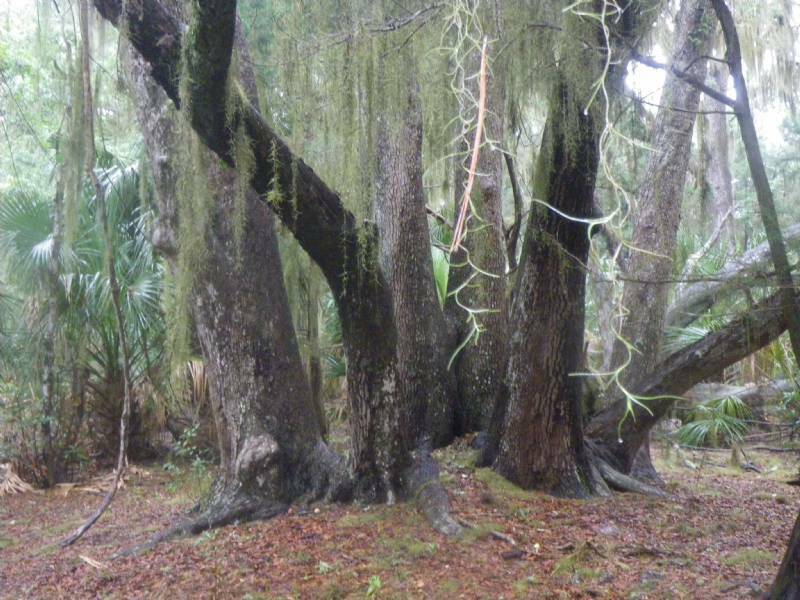 Florida Sea Kayaking Association and author(s) of individual reports shall not be held liable for any omissions and inaccuracies contained herein. Readers are cautioned to supplement reports with other sources of information when planning a trip.